Okay, perhaps ‘lazy’ isn’t appropriate, but certainly ‘no dig’ is a lot easier than ‘dig till you drop’! This article is to do with a more sustainable way of gardening and it’s to help you understand a little more about how to protect your soil – a very precious resource – making hard digging a thing of the past. This concept falls under the term ‘permaculture’. This terms refers to working with nature and using sustainable garden practices. The ‘no dig’ garden focuses on what to do with your soil to ensure that weed growth is minimized naturally and nutrients are kept at optimum levels. First of all, the important thing to remember is that bare soil is vulnerable soil. It gets dried hard by the sun, washed away by the rain, blown away by the wind and nutrient deprived by weeds. The best way to avoid these issues is to keep the soil covered as much as possible. What coverings are best for soil? Plants. Mulch. Compost. Manure. All great plant coverings that help sustain the soil and protect it from the elements. Soil without nutrients is just dirt and it has a hard time supporting growth. Soil with nutrients is a garden petrie dish just waiting to sprout forth. Soil does best when it is not dug. Digging encourages the breakdown of the soil and it invites weeds to take root. When the soil is adequately mulched, weeds are discouraged. Unfortunately, you will still get weeds appearing and it’s best to pull them out while they are still small and before they’ve spread. Instead of trying to condition the soil by digging, cover it with a layer of well rotted compost or mature mulch. A layer of between 1 and 2 inches is best. If you add sea soil to your garden, sea soil is so rich in nutrients and humus that mulch is not necessary. Adding mulch, compost, manure or sea soil improves water retention without making the soil water logged. Take care of the soil both right after planting and when you remove plants. For instance, if you are planting vegetables, add the mulch as soon as the vegetables are planted. When you harvest the vegetables, mulch again. Don’t leave the soil bare. You might have noticed that earlier we mentioned ‘mature mulch’. This is important. Fresh organic matter provides a habitat that attracts pests into your garden. Slugs, snails and rodents like it. Once the organic matter is mature, it has broken down considerably and doesn’t offer them shelter. You can create your own mulch by mixing compost, manure, leaf mold, grass clippings and even rotten hay. Let it mature for several months to a year before using to enhance your soil. When it’s mature, you don’t need to dig it into the soil. All you have to do is spread it over the top. Make sure all your bare soil is always covered. Even if there are only small patches of bare soil, put mulch over them. If left alone, these patches will grow. Be sure to mulch before the Winter as this season is particularly hard on bare soil. A properly mulched garden is an easy garden to plant. No hard digging is necessary as the soil composition is loose and easy to work with. It’s crazy, we know! At the height of the Hanging Basket Season you can save 20% off the purchase of a regular priced Hanging Basket! Just bring in this coupon and present it at the time of purchase! It’s our way of saying “Thank You” for your support over the past 20 years as we celebrate our 20th Anniversary! The actual herbs that make up blends of Herbes de Provence vary from region to region and of course by taste and smell! Rosemary is used lavishly along with thyme. Bay Laurel adds its sweet essence to the bouquet. Oregano may be added, giving it an Italian flavour, or Majoram for a slightly Oriental twist. Majoram should ideally be used fresh as it tends to lose its flavour once dried. Sage, in small quantities, is also a popular ingredient. Lavender blossoms, Savory and Fennel seed add that very special ‘Provence’ character. The amounts in the recipe below are really just approximations as they will vary according to individual taste and preferences. No two batches will ever be exactly the same. But that’s the charm of authentic Provencal herbs! The most fun can be had by growing your own herbs, gathering them and using them fresh, or dried, to create your own special blend. Delight friends and family by giving sachets as gifts! Herbes de Provence are wonderful when sprinkled on flat bread with olive oil or on grilled meats, poultry or vegetable dishes. Go on, taste the sun! Grind Rosemary and Fennel seed in a spice grinder. If ever there were two easy going dependables in a garden they are Heucheras and Hydrangeas. Heucheras, also known as ‘Coral Bells’ are hardy little stalwarts with fabulous foliage that makes them perfect borders, containers, hanging baskets, under trees or anywhere where you need a little colour without the fuss of flowers. They are great in flower arrangements and last longer than flowers! There are over 50 varieties although only a few are available commercially and those are mostly hybrids. They grow with virtually no help and are drought resistant. They’re perfect for novice gardeners as they’ll survive an amazing amount of neglect. In addition, they come in a number of varieties and colours allowing you to create an interesting collage just with Heucheras if you choose. They grow to between 12″ and 26″ high and spread about 18″ wide, preferring part shade and woodland conditions. They develop interesting, delicate sprays of flowers during late Spring, early Summer. Best of all, they maintain a gorgeous display of colorful foliage even into the early Winter. Over Winter they may die down a little, but as soon as it begins to warm up, they’ll fill out again providing months of showy colour. Heucheras also attract butterflies and hummingbirds. We have some beautiful varieties in stock right now, so pop in and take a look. From very small shrubs to vines and large shrubs or tree like there is one for every size garden and with some for sun, shade, moist and dry soil, hot and cold, you are sure to find the perfect addition for your garden. hydrangeas are naturally woodland plants and most but not all like to be sheltered from hot afternoon sun. Hugh cover of trees with dappled shade is ideal as well as the north side of houses or walls. Full sun can bleach out the colour of the flowers and scorch the leaves, especially some of the more tender Japanese serrata varieties. Plants grown in some shade seem to glow under the canopy of larger trees. Some cultivators do prefer a little more sun, in particular: Paniculata and Quercifolia. Macrophylla and Serrata varieties benefit from some shade cover. What kind of soil should I plant my hydrangeas in? AS a general rule hydrangeas prefer moist, humus rich soil although there are a few that will handle more drought and poor soil conditions; Aborescens, Paniculata and Quercifolia for example. What about Cold and Wind? The majority of macrophylla and serrata hydrangea bloom on wood produced the previous season. Flower buds are carried away through the winter and can begin to develop early in the spring ready to produce this years flowers. At this point they are very tender and can easily be destroyed by cold winter winds and late frosts. Varieties that bloom on this seasons growth are much more cold and wind tolerant. Some of these varieties include: Arborescens, Paniculata, Petiolaris, and Quercifolia. Likely the most fascinating and commonly asked question of this plant. Only the species of the macrophylla and serrata and their cultivars is this true of. The color of hydrangeas will depend on the acidity of alkalinity of the soil. PH of 6.5 or less – produces blue hydrangeas (however sometimes even in acidic soil the plant is unable to access aluminum in order to produce the blue desired. Adding a bluing agent such as aluminum will harm the plants roots. As a general rule a solution of 1 1/2-3 grams of aluminum sulphate to a litre of water can be applied to 2-3 year old plants throughout the growing season. To make the soil more alkaline just add lime or ash. Most hydrangeas need little if any pruning. A little dead heading in the late winter of last years spend flowers is all that is needed for many varieties. In most cases, no pruning is better tan wrong pruning. Macrophylla and Serrata: This hydrangea blooms on last years wood and therefore care should be taken to only remove spent flowers down to the first set of buds, as those buds should produce next years flowers. An occasional thinning of stems may be necessary. To do this simply cut out the oldest and spindliest twigs out of the plant to encourage new and stronger wood. If the hydrangea has to be controlled in size, I like to prune back harder the flowering stems of this year and leave the stems that did not flower this year, and so on each year. This produces some control of the size and still allows for some blooms but better yet plant a smaller variety that will not need to be pruned. Arborescens: blooms on new wood and therefore can be pruned back each year to the ground. I prefer to leave the last years wood to harden off so that it can support the weight of the huge flowers that will be produced on this hydrangea. Paniculata: blooms on new wood and can benefit from pruning. As a general rule let the shrub grow for 2-3 years staking the stems. After I have strong stems to a height I want then prune back up to 1/2 the new growth each year to produce more blooms. Quercifolia: rarely needs any pruning other than to remove damaged branches or to control growth. Remembering that it blooms on last years wood you dont want to cut back too much of the plant of you will lose the bloom. Petiolaris (climbing hydrangea): rarely need pruning other than to keep it from growing where it shouldnt be. It will quite happily climb up tall trees or climb on walls. If you must drastically prune back a hydrangea that blooms on old wood for any reason, be it to reduce size or regenerate new growth or after damage, you can, after all fear of frosts for the season. All stems should be cut back to about a foot to a foot and a half from the ground. You will loose all flowers for the year or two but it will generat lots of new growth and flowers should appear the following year. Hydrangea Mac: Pia, Hornli, City Line Series, including: Berlin, Paris, Vienna and Venice. Hydrangea serrata include many of the Japanese varieties. Hydrangea Mac. Adria, Domotoi – usually a brilliant blue, Enziandom – considered by some to be the best. Generale Vicomtesse DE Vicraye, Nikko. Lace caps would include: Mariesii, Eisvogel or Kingfisher. In Japanese varieties try Izu no hana. Hydrangea Mac. Glowing Embers, Pia, Hornli. Japanese varieties would include Preziosa. Whether you only have a small garden, or whether you only have a small space you want to devote to herbs, you can still grow more than enough for your own needs! Container Herb Garden: The ultimate easy way to grow herbs in very little space is to grow them in containers. Containers are often easier than growing herbs in the ground. First of all you don’t need too many seedlings. Just a few will fill up the container making it look great. Too few seedlings in the ground can look a little weak. In addition, you can easily move containers so that you can showcase those that are flowering or take advantage of the best position as the weather and seasons change. We recently held a workshop all about herb gardening in planters. If you missed it, never fear – we are still here to answer all your questions and help you get going the right way. Herb Planters: These are similar to containers, but are usually a little more utilitarian and bigger. Using a planter means that you can create a mini ‘raised bed’ easily in a ready made wooden planter or even make your own. A herb planter can accommodate a number of different varieties of herbs. Come in and chat with us to find out which ones grow well together. Make your planter mobile by putting it on wheels so that you can take advantage of the best position for your herbs at any one time. 3. The Pretty Pot Indoor Garden: This is perfect if you live in an apartment, don’t have any outdoor space or just want to add some green decor to your kitchen. Plant each different herb in a pretty pot in the accent color of your choice. Be creative. You don’t necessarily need to buy pots. Mason jars work well as do jam jars or any of a number of containers you might ordinarily put in your recycling bin. Paint them or cover them in fabric to create the color accent you desire. These make perfect gifts as well as great additions to your home. Place the pots in a spot where they will get bright light – perhaps your kitchen windowsill? You’ll have a handy, ready made supply of culinary herbs whenever you need them! 4. Hide them in plain sight: Let’s face it: herbs are often not the prettiest of plants. If you don’t want to dedicate a space outdoors or indoors for growing them, you can hide them in plain sight by interspersing them amongst your flowers in a flower bed, or amongst your veggies in a vegetable patch. Come in and chat with us to find out how companion planting should be done so that the herbs will thrive. An additional benefit to this is that many herbs will ward off pests from your vegetables. 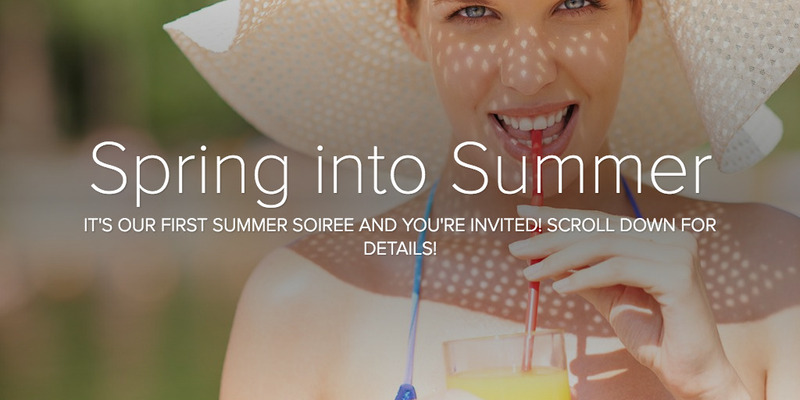 It’s our first ever SPRING into SUMMER Ladies Soiree! Attention Ladies! You’re invited to an exciting event designed just for you and your girlfriends! Just click on the image below and you’ll find all the details! The invitation will open in a browser window. Scroll through and then call us to book your spot! Although we are only in Spring and the Summer water restrictions haven’t yet started, the weather has become so warm that it won’t be long before they do. Not only will this make more efficient use of the water used, but the plants will be healthier. Your garden will have time to absorb the moisture and before the heat of the day and there is less evaporation. Your containers tend to dry out more quickly so watering n the afternoon allows plants to absorb moisture after the heat of the day and throughout the evening. Avoid watering during the evening as the moisture will not dry off the foliage and flowers and can encourage fungi to grow. Always water before the plants begin to wilt. Leaving watering too long can result in fatal damage to the plants. Use Sea Soil in your beds and containers. It’s even more efficient and nutrient rich than regular mulch. In fact when you use sea soil you don’t need to add mulch. It also has a better water retention. Redirect, reuse, recycle: Saving your excess cooking water and using it to water your plants is not only going to save on watering but it will also help to fertilize plants. Catch rainwater from your roof in rain barrels and re-use in your garden rather than letting it slip into the sewage. Add your home made compost to your soil for better water retention. Saving your vegetable and plant waste and using it to create compost is a great way to garden sustainably. Raised beds and natural material glazed pots will lose more water to evaporation than glazed or non-porous pots. Use native plants that are drought tolerant in your area. They thrive in the natural climate and therefore don’t need as much water as many non-native plants. If you’re interested in Xeriscaping, we are having a free seminar about this on June 25th, 2016. Find more detail here and call to register. It’s May, it’s getting warmer, it’s time to think about making your garden pretty and productive! It’s the time to put your landscaping plans into action and take a few basic steps to ensure that your garden looks great during the rest of spring and early summer. Start thinking about where you want to plant those warm weather annuals and what colors you want to dominate. Petunias, marigolds and other summer favorites are already showing up in the garden center. Get those containers and planters prepared with sea soil. Sea soil is also great to add to your garden beds. If you want to grow veggies, you can begin planting seedlings as soon as the danger of frost is over. Check in with us to see what’s available and the best time to plant outside. It’s a good time for planting summer bulbs as well. Think gladioli, canna lilies, and begonias. If you’re using containers in sheltered areas you should be able to begin planting things such as tomatoes, peppers and some herbs right now. Now’s the time to begin dividing those perennials that are starting become a little crowded. Remember to continue dead-heading the dead flowers on plants that are blooming right now if you want them to continue blooming for as long as possible. Prune spring blooming shrubs and trees once they’ve finished blooming. Provide support such as stakes or lattices for those plants that are growing lanky and tall and need a little extra help. If you need advice, or if you are looking for gardening equipment or the healthiest plants in the Fraser Valley, please visit us at Tanglebank Gardens. We have professional horticulturalists on staff who are happy to help! Spring at Tanglebank! Newsletter is live! Click to see the latest newsletter!